Not a member? Join now to register for this webinar and to view our library of past webinars along with many other HSA Member-only benefits and discounts. Or see below to register and pay to attend this webinar. Perhaps you have thought about expanding and growing something different in your herb garden! While many of us grow herbs such as basil, rosemary and thyme, there are other, less common herbs that are well worth growing, too – perfect for bringing exciting and unexpected flavors to foods and drinks, and beauty to your garden! Maybe you will find a place in your garden and kitchen for these unique herbs. Theresa Mieseler has been a life member of the Herb Society of America for over 40 years. She was the editor for the Bay and Calendula Essential Guides, chaired Botany and Horticulture, was a member of EdCon from 2009 to 2011, and is the 2010 recipient of the Nancy Putnam Award for Excellence in Horticulture. 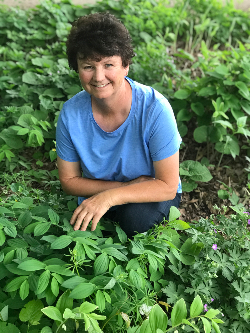 Theresa and her husband Jim, founded and operated Shady Acres Herb Farm in Chaska, Minnesota for 39 years. In 2016, they closed their greenhouses and semi-retired. Theresa was on staff at the Minnesota Landscape Arboretum from 1969 to 1991 – where she was the curator of the herb gardens, conservatory, wildflower garden, and prairie. In 2012 she redesigned the kitchen garden and in 2014 redesigned the Cloister garden at the Arboretum. She has written for numerous magazines and presents extensive programs and lectures on herbs. She is a past vice-president and member of the International Herb Association. In 1991 she introduced Shady Acres rosemary to the herb trade. Herb website is www.shadyacres.com. Non-member class fee is only $5.00! Register below. Join Now and Avoid the Webinar Fee! Webinars are a dynamic educational opportunity covering a variety of herb-related topics. Members enjoy the ability to participate in both scheduled webinars as well as view recorded presentations in our Webinar Library. Topics vary widely, including using herbs in cooking, crafting or healing; distilling essential oils; growing methods; and exploring herbs with modern day and historical significance. A new webinar is scheduled each month! Members are welcome to view webinars previously recorded at any time and free of charge in our Webinar Library. View this complimentary webinar For Us and Them, Edible Native Plants for Pollinators with Dan Jaffe here.